Successfully Added Portable Wireless Receiver with Camera Surveillance Set (PAL) to your Shopping Cart. Portable 2.5" wireless receiver with camera surveillance set in PAL. This wireless surveillance combo is perfect for children and baby monitoring. If you are looking for an effective surveillance system for your home or small business, look no further. 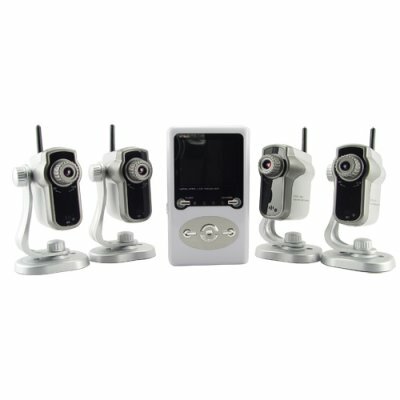 This wireless surveillance system comes with 4 wireless cameras and a handheld portable receiver with 2.5 inch screen. You can have a range of flexible surveillance solutions with this wireless and portable security system. Expecting unwelcome guests? Just install a camera over the door and see who's approaching before they even knock on the door. With easy to install cameras, good quality video and the ability to link to a TV monitor, the uses of this wireless surveillance unit are limited only by your imagination. Setting up your own wireless surveillance system is quick and simple. The four wireless cameras are easy to install and require only a power source. With two rotatable joints and a viewing distance of up to 15 meters, the cameras can be easily aimed at any location, no matter whether they are installed on the wall, floor, or ceiling. The wireless receiver can be positioned at a distance of up to 15 meters from the cameras and can connect to a TV through AV out so you can monitor your cameras on a large screen. Tell your friends you got a great deal on your wireless surveillance system from the leader in direct low price electronics, Chinavasion.